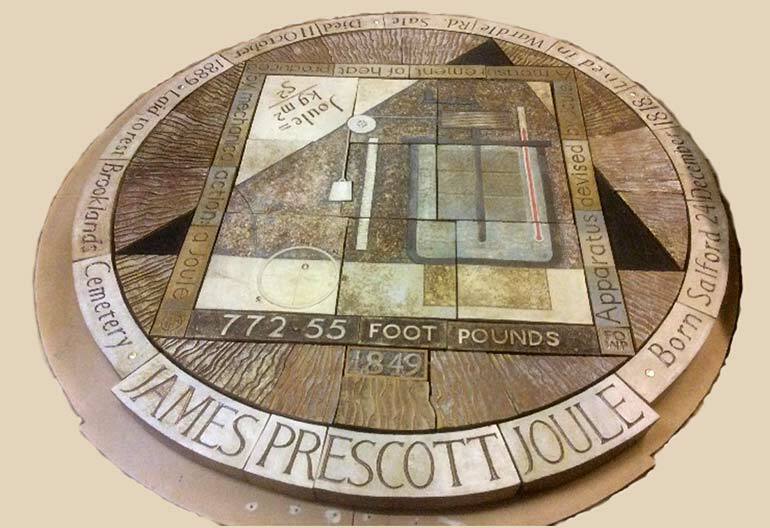 A special event is being prepared in Sale to celebrate the birth of James Joule. He attended St Paul’s Church and was buried in Brooklands Cemetery following his death in 1889. Friends of Worthington Park (FOWP) have raised money for the ceramic pavement to be made and installed, with the work being done by local ceramicist Gordon Cooke. The work will be unveiled by Trafford Mayor Tom Ross, alongside children from St Joseph’s School. Moorlands, Worthington and Springfield primary schools have also been involved with the project following visits by local scientist David Ward. Funding for the artwork has come from a donation from a local resident, The Sale Mayoral Fund, Manchester Airport Community Trust and the Heritage Lottery Fund. The artwork installation has been aided by Trafford Council and local residents Mike Drain and John Kennedy. The granite setts were donated by the Hogan Brothers of North Wales. Nona Dougherty, FOWP chair, said: “We were passionate about making this happen. James Joule is a legend in the science world and it is right that we honour his work and his life in this way. “He is one of Sale’s most famous residents and it is fitting that this beautiful piece of artwork is installed here at Worthington Park. Trafford Mayor Tom Ross said: “I am delighted to be able to unveil the ceramic pavement. Every day, we see joules mentioned on our food labels but not many people know that it was named after the scientist who lived right here in Trafford. The unveiling will take place at 11.15am on April 12. The artwork itself features notable dates and details from his life and has the number 772.55 etched on it. This is the figure Joule calculated for the mechanical equivalent of heat.